Elegant with a hint of eccentricity, stylish without the accompanying attitude, and perfectly located for exploring Union Square and the downtown Theater and Financial districts. A glamorous San Francisco luxury boutique hotel, the Hotel Monaco offers style and comfort for the most discerning of travelers. With its French-inspired architecture and sensually rich decor, the Hotel Monaco, an award-winning Kimpton Hotel, will seduce and pamper you, allow you to indulge your senses. Located just footsteps from our hotel in downtown San Francisco are Union Square, Moscone Convention Center, the downtown Financial District and the Theatre District, offering our guests an ideal location during their stay in the city. Offering some of the finest luxury hotel suites in San Francisco, the Hotel Monaco features 201 exquisitely decorated guest rooms, including 24 designer suites. The same enticing décor of these guestrooms and hotel suites starts the moment you step through the door... notice the front desk reminiscent of a steamer trunk . . . delight in the lobby with its giant fireplace and whimsical frescoed ceiling . . . take in the elegant painting of the Celestial Lady welcoming guests over the grand staircase . . . step in to the sophisticated and inviting Living Room where morning coffee is served and our wine reception is held each evening. 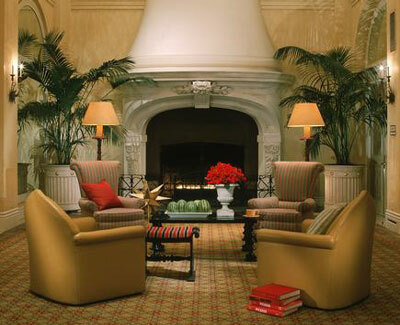 Guests at the Hotel Monaco in San Francisco also enjoy a wealth of amenities. Our hotel features Spa Equilibrium, an on-site spa, set in an atmosphere evocative of a contemporary Roman bath. Once you've regained your equilibrium, take advantage of our concierge and administrative services, which are always available. Complimentary high-speed Internet access, overnight shoeshine, valet and laundry, 24-hour room service, expert massage and a soothing manicure are also services we offer at the Hotel Monaco San Francisco, ensuring your stay with us is complete.